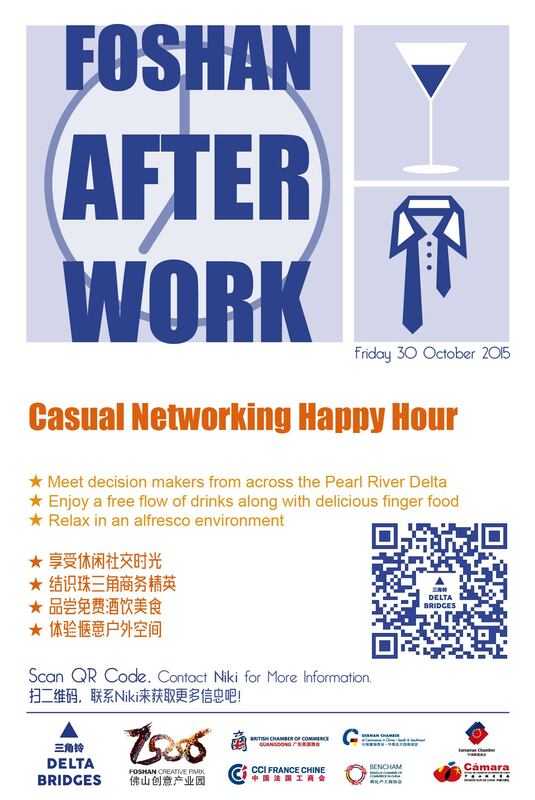 Foshan After Work is a casual networking event for the Pearl River Delta business community. The upcoming 8th edition will take place at the 1506 Foshan Creative Park from 7pm till 9pm on Friday 30th October. The event is brought to you by Delta Bridges and 1506 Creative Park, in cooperation with the European Union Chamber of Commerce South China Chapter, CCIFC South China, the German Chamber of Commerce in South China, the British Chamber of Commerce in Guangdong, the Spanish Chamber of Commerce in South China, Bencham PRD and Dezan Shira. The event is also supported by the following venues: Intercontinental Foshan, Swissôtel Foshan, Hilton Foshan, Marco Polo Lingnan Tiandi Foshan, Bodun International Serviced Apartment Foshan, Tabu Lounge Bar, Dope Restaurant and Bar, Warehouse, Prosciutto Panino, Three Drops and Lifebloom Cafe. Complimentary transportation is provided from Garden Hotel Guangzhou to Foshan Creative Park. Let us know when you RSVP if you need to book a seat. For those wishing to stay the night and explore Foshan nightlife, Swissôtel Foshan is offering a special price: 630 RMB for a Premier Room (King bed) including 2 breakfasts. Please let us know soon if you need a room as the hotel will have a high occupancy rate that night. If you wish to attend, please send an email to niki@deltabridges.com by Tuesday 27th October, stating your full name, mobile number, company name, job title, whether you would like to have a seat on the bus from Guangzhou Garden Hotel to the Foshan Creative Park, and whether you would like to book a room at Swissôtel Foshan.